Fred is reputed to be one of the best supporters the Sky Blues ever had. “I’ll support them as long as I live!”, he declared. There was a large gathering of workmates to see Fred Stanton (left) receive their retirement present to him. Mr. E. H. Holland, Herald Paint & Trim stores foreman, made the presentation. Fred thanked everyone. Fred was at Fletchamstead in Engine Reconditioning under foreman Vic Chant approaching 20 years ago. Then he moved to Unit Reconditioning at Canley. Seven years ago he sought a lighter job and became a storeman in the Herald Paint and Trim Stores. 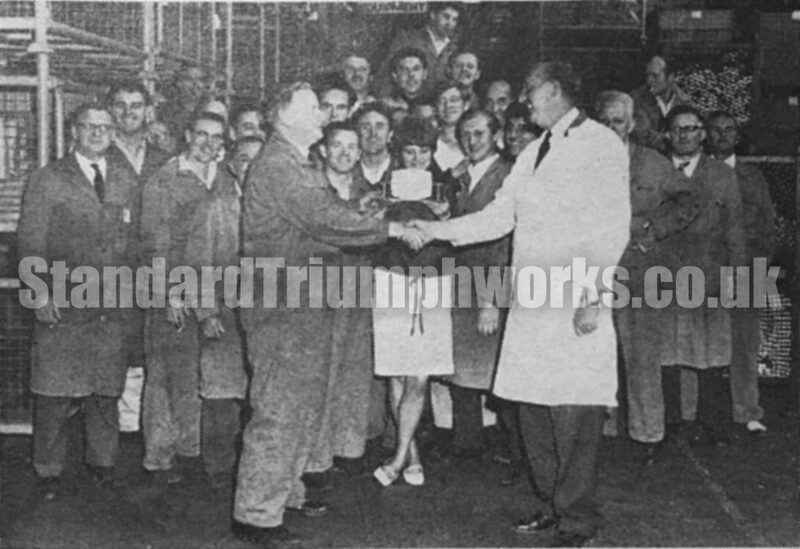 On behalf of Fred’s workmates and friends, Mr. E. H. Holland, foreman, presented him with a modern 8-day clock bearing an engraved plate. Fred was also thanked for his very useful work. Fred Stanton will enjoy his leisure by helping his wife, and cultivating his garden. He will, of course, be following the Sky Blues whenever he can. He hopes to be cheering them on in the 1st Division next season !